I meet many people who hate the look of their home from the exterior. Perhaps some have reason to want to change it, while other homeowners are just bored of the way it looks. Driving up to the same house for over 20 years can be a reason to want to mix things up. Even if you do not change the structure of the home, adding some fancy “curb appeal” can make a big different. Adding flower beds and some landscape lighting can make a world of difference. If you have some trees in the front lawn, think about adding a light from below that illuminates the tree at night. It gives a real upscale look to the property. If you would like to seriously change it up, there are a number of things you can do to get the look you want. Adding a shed dormer or a pair of dog house dormers to the front of the house can give a more layered look and gives some extra character to an otherwise flat facade. The dormers can also provide you with more interior space or dress up an otherwise basic room with some additional natural light, and perhaps a window seat. Adding a porch can also give the front of your house a nice new look, and it is functional! Imagine sitting on the front porch watching the kids play (or grandkids!). Up to you if you want to add the rocking chairs! Maintenance free decks are really popular because we all just don’t have the time to maintain it year after year. Adding the white composite rails really makes the new porch pop and like most homes, if your current trim is white, it really brings everything together. Want to add a roof to your new porch? This is an absolute envy of the neighborhood. Sitting out on the porch while it is raining is so relaxing and romantic! Add some recessed lights with a ceiling fan and you will be in heaven. To take it a step further, you can extend the entrance of your home with a mud room. This can be incorporated with your new front porch. Need space for all the jackets, shoes, boots, book bags…? Adding some custom built-ins makes storage of these items neat and organized. You can also buy organizational cabinetry and create your own style that meets your everyday needs. If you live in New England (or other places where it gets cold in the winter), add some floor heat to your mud room. Nothing better than taking off your snow boots and placing your feet on the heated floor on those really cold days. Whatever your reason is to change up the front of your house, remember you have many options which can fit into most any budget. Take a step outside and let your imagine run wild! Whether you are updating your bathroom, kitchen, building a deck, or adding another room to your house, you are likely increasing the value of your property. In one way, shape, or form, your home’s value influences your home insurance rates and coverage. With special home additions, such as a new deck, you have more room and features to cover. With a small increase in home insurance rates to follow, it is highly recommended that you let your policy holder know of the addition. This is because your home insurance covers your home’s current value. With more space, your home is worth more, meaning that you want to make sure your policy coverage is on par with your home’s value after the addition. It is worth it to let your home insurance company know of the work done so that you can ensure everything is covered. With the minimal increase in home insurance rates, the pros far outweigh the cons for letting your policy holders know of the additions. This is because if your home was ever damaged, your insurance company can expedite the claims process to fix the damage. Otherwise, your insurance company may hire a private home inspector to make sure there was no fraud or negligent behavior involved which can delay the fixes. There are many additions, features, and special renovations that can add variable value of your home from your insurance’s perspective. For example, building materials plays a large part on the value of the renovation or addition. Higher quality raw materials mean higher value because it is likely a higher cost to replace. You want to take note of the materials because if something ever damages your home, your insurance company needs to know the costs to replace the damage. You don’t want your insurance company to assume average costs because you may get the low-end of the price, meaning that you would lose money on the claimed damage. Another aspect is special architectural features. A new mother-in-law apartment would cost more to replace. Which all need to be covered by your home insurance policy. You don’t have to tell your insurance company know, but it recommended that you let your insurance company know before your project. Again, this speeds everything up, and offers you a chance to negotiate better rates if you felt inclined. It is always recommended that you investigate saving money on your home insurance. You may find that you are missing a decent discount opportunity that was overlooked when you signed up for the policy. Another aspect you need to take not of is your liability coverage. Adding a deck comes with a beautiful addition to your home that enables you to relax and kick back. But, it does add an increased risk of injury. For example, basic liability is $100,000. This protects you from claims by others for bodily injury or property damage. With additions like a deck, you might want to consider increased coverage to $500,000 which only costs around an extra $25 dollars a year. Installing new kitchen cabinets is one of the main driving forces that brings up the cost of a kitchen remodel. Everyone wants nice cabinets, but there is a price to pay. There are many cabinet manufacturers out there. Some more expensive than others. WHY IS THERE SUCH A DIFFERENCE IN PRICE FOR THE SAME CABINET? Well, there are differences between a low end cabinet versus a higher end cabinet. If you want a cabinet to last a long time, go with one that is an all plywood construction. Lower end cabinets use MDF boards, which crumble and fall apart over time. Also, you want the finish to be good on the exterior of the cabinets, such as a stained or painted finish. The lower end cabinets use a laminate over the exterior which peels and makes the cabinets look awful. So, you now know you probably don’t want the lower end cabinets, but how much do you have to spend for something better? Again, many cabinet manufacturers out there so the costs will vary. For my money, I like Kraftmaid cabinets. They are a quality cabinet for not a lot of money. They have all the bells and whistles. With their line, you can get the soft closing drawers/doors, specialty cabinets such as cooking sheet cabinets and pull out spice racks. So many styles of cabinets to choose from. Literally, you can take the exact number of cabinets you have now and install the newer, more functional cabinets and gain another 20% storage. Visit your local kitchen supply house or lumber yard and check out the many different options out there. It is always great in the late Spring/Summer/early Fall to get out on your deck and relax. If you are fortunate enough, you have plenty of room for a table and chairs as well as your barbeque. The question I get asked a lot is what type of decking should you use? Well, this can come down to a personal preference, but typically it is a cost issue that steers customers one way or the other. Options are few but vary in look and cost. Pressure treated decking is the most popular and least expensive. Next there is Cedar, which is not much more expensive than pressure treated but is a softer material so it can show scratches over time. The most popular decking now is composite. You are probably familiar with brands such as Trex and Azek. Although it does not look like real wood, it does afford the luxury of not having to maintain it every couple of years. But if you want the Cadillac of decking, you can always install IPE. This is a hard wood that is impervious to the elements. Looks like wood, because it is, but never needs to be treated. It weathers naturally. Very labor intensive to install due to it’s density, all of the screws/fasteners need to be pre-drilled. Many options to choose from but as with most things in life, it comes down to preference and of course, money! For more information, or for a free consultation, please give Shaw Remodeling a call at 860.434.2004. We would be happy to sit with you and discuss any questions you may have as well as the many options there are available to you. Super excited to share this article published by NerdWallet, featured in USA Today! Special thanks to Beth B. for reaching out to us with the opportunity. "February signals the start of tax season, a time when many Americans gain nearly $3,000 on average in the form of a tax refund, according to the IRS. Here are some home improvement ideas in several price ranges so you can put that tax refund to work..."
Tired of the same old options for flooring? Tired of being told what belongs in which room when it comes to flooring? The debate continues on what is the “proper” flooring to install in a kitchen. You will hear the typical response from most people. “Kitchens and Bathrooms always have tile on the floor!” Not true anymore. With the introduction of some new flooring options, you can change it up from the norm or get the look you want while staying traditional. Kitchens are the big one where people want to change things up when it comes to flooring. They like the idea of tile on the floor because it is easier to clean. Some of you are probably saying, “What about the grout lines? They are always dirty and discolored.” Yes, that is true. The older grouts that were used more than five years ago do stain and discolor. Very little you can do no matter how much you scrub. If you like the look of tile with grout lines, there is some good news. Grout today has a stain resistant chemical already mixed in. This provides a barrier from the dirt getting into the grout. “Will my grout still look dirty?” Only temporarily. If it looks dirty, a basic cleaning will bring back the color it was when it was installed. For those of you who may be skeptical, there is another option when it comes to grout. Stay away from the really light colors. Pick up a darker shade or fleck in your tile. This way you have the safety of the treated grout but not the risk that it may tarnish over time. For those of you non-traditionalists, hardwood flooring has been very popular. Many people like the hardwood to be continuous throughout the kitchen and into other adjoining rooms. This gives a very clean look without the visual separation of the spaces. I can hear some of you questioning whether the wood is really a good idea in a kitchen. I see your point. The concern is whether the wood floor can hold up to water, right? To be honest, consider how often you have large amounts of water on your kitchen floor unless you are mopping the tile and grout or you have sprung a leak in the sink or dishwasher. Probably not very often. The amount of water you have on the kitchen floor with hardwood would be similar to the amount of water you have on your shoes when you come in from the rain. And don’t you sometimes walk on the hardwood floors with wet shoes? Once a hardwood floor has been finished, the poly gives it a protective finish for basic, everyday use. So, what if you want wood and still think tile is the best way to go? Ah, thanks to the tile industry and their crack team of creative thinkers, there is now a tile plank. Yes, tile and the wood look you want all in one! Tile planks come in different widths and lengths so it can look like wood flooring. You can do very small grout lines between the planks so it does not look like tile. So many options when it comes to tile planks, a multitude of colors and styles to choose from. Ok, now for the really adventurous group. How about we take this to a new level? May I introduce LVT? What is that? LVT is short for luxury vinyl tile. Yup, I hear the groans. Vinyl? Yuck! Take that out of your head. LVT also come in planks or squares to look like tile, but they can also look like wood. It is glued down so it does not move. No grout lines to deal with either! And the best part? It is softer on your feet than tile or hardwood and it is actually warmer to the touch. Tile and wood can be cold in the winter but LVT stays more in line with the room temperature. I did, however, have a customer ask if it will hold up to knives. To be honest, I was not sure how to answer that! I’m not sure about you, but we don’t have an issue with flying knives in my house! Also, side note, I put this in my kitchen and could not be happier! And we keep our knives in the drawer! So, when you are thinking of installing a new floor in your kitchen, check out the many new options you have at your local flooring supply store. Stay traditional or change things up. Now, the choice is really yours! 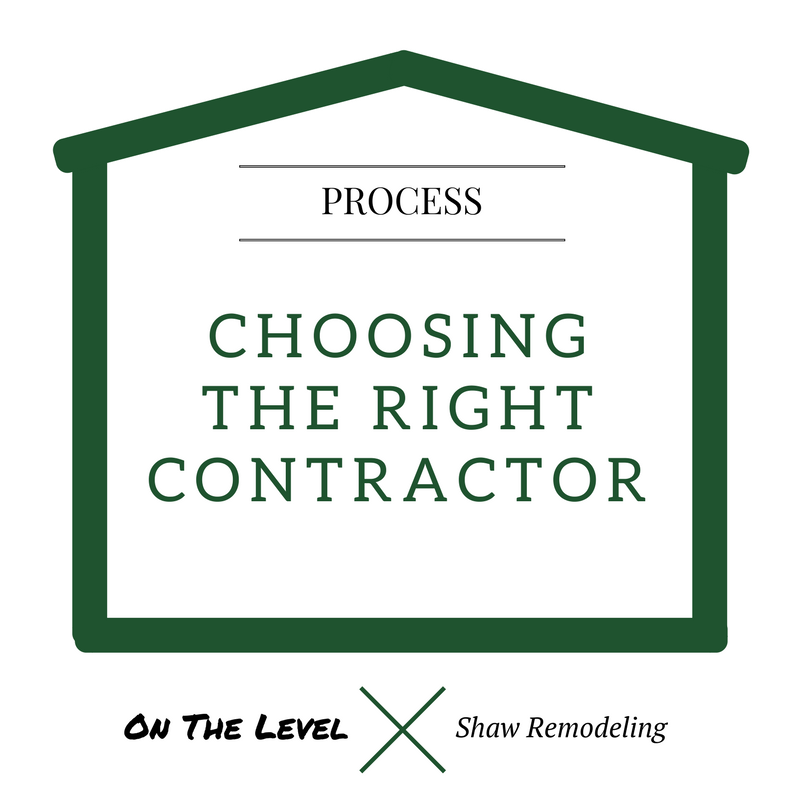 For more information on how to select the right contractor, or for a free consultation, please give Shaw Remodeling a call at 860.434.2004. We would be happy to sit with you and discuss any questions you may have as well as the many options there are available to you. YOU’RE FINALLY READY TO GET THAT BRAND NEW KITCHEN OR TO BUILD THAT BEDROOM ADDITION. This is something that you have been thinking about and planning for a long time. There are usually many contractors to choose from, all with varying degrees of ability and history. The first step is to find a contractor that fits the project you are doing. There are always “specialists” that claim to be the best Kitchen Remodeler or the Bathroom Professional, but talking to contractors gives you much more insight on what their abilities are and projects that they have done in the past. YOU’VE STARTED MAKING CALLS AND ASKING FOR QUOTES. Now that you have called the contractor, did someone answer the phone? If you left a message, did they call you back or did you have to call multiple times? There are many stories that I hear where customers call the contractor numerous times, but never hear back. Others finally get a contractor to take a look at the project, but never receive an estimate for the work. Some people say, “Well, that is just how contractors are.” Not true. Business 101 is important no matter what field you are in. Customer service starts at the first phone call. If you are not taken care of on day one, how do you think the rest of the relationship will go as the project is underway? IT IS IMPORTANT TO GET AT LEAST THREE ESTIMATES FOR THE PROJECT YOU ARE LOOKING TO HAVE DONE. Although you will hopefully get three different prices, the main reason for getting three estimates is to get to know three different contractors, how they approach customer service and the project at hand. This is also a great time to get ideas for the project where you can implement various ideas into the final project layout. Of course you have your vision of the final product, but professional contractors have seen many variations of remodeling projects, so it is important to keep an open mind. At this point, you have all of your estimates in hand. I never recommend going with the lowest price solely because it is the lowest. The potential cost involved for fixing what the lowest bidder did will undoubtedly cost you way more in the long run. On the same token, I do not recommend going with the highest price assuming that you will get the best service. I would suggest doing some homework and making sure that the price is realistic. The internet is a great way to check the authenticity of the estimate. There are many blogs where other homeowners share their experiences and costs for the project. Keep in mind, prices change based on geographical location so make sure that you are comparing apples for apples. THE NEXT STEP IS TO DO A BACKGROUND CHECK ON THE CONTRACTOR. The Better Business Bureau is still a good reference site but another important, and often overlooked, source is the Department of Consumer Protection in your state. This is where you can verify that the contractor is licensed. It is crucial to get a licensed contractor, as this will protect you moving forward should something go wrong during the project. NOW THAT YOU HAVE SELECTED YOUR CONTRACTOR, GET A CONTRACT. Everything should be detailed out in the contract. This is your only legal recourse if there is a dispute on what is, or was, being done. For instance, the Department of Consumer Protection will require that you have a contract with a licensed contractor. All contractors pay a yearly fee to the Department of Consumer Protection which has a portion set aside for the general fund which homeowners can recover damages for a project that went bad. Clarity in the contract is very important. Ask for revisions and make sure everything is outlined so there are no questions about what is being done. DOING YOUR HOMEWORK AND CHECKING REFERENCES IS ALWAYS THE BEST WAY TO APPROACH A HOME REMODELING PROJECT. Advertisements do not accurately tell you what you need to know about your contractor. Ask for client references, check the internet, check your local BBB and most importantly, check with your state’s Department of Consumer Protection. If there are any negative reports on their record, ask for a copy of the report and you will have more insight into their competency. As with many industries that work with the public, you cannot please everyone 100% of the time, but if there is a theme in the negative report, take that as a warning. When Should You Have An Architect Do Drawings? DRAWINGS – WHY DO I NEED AN ARCHITECT TO DO THEM? I have seen just about every type of “drawing” over the years. From architectural, to draftsman, to one that a homeowner does on graph paper, to someone who jotted some ideas down on a napkin. Many customers when they hear architectural drawings they see dollar signs. Understandable. However, there are other things to consider, besides the upfront cost. A good set of drawings by an architect can, and should, save you money in the long run and ensure that you get exactly what you want from the contractor. A good contractor can follow a well laid out set of plans so there are no confusions during the project. I have seen prints that were not very detailed which ended up costing the homeowner more as modifications had to be made during the course of the project to make certain things work. Not only does the architect have a great deal of knowledge when it comes to structural aspects of the project, they also know what a contractor needs to accurately bid the project and what to order. A window/door schedule is very helpful when an order is placed. Leaves zero room for error. As a contractor, I’m always very happy when there is a good set of prints to work off of. The project runs smoothly and the homeowner is always happy when we’re finished. For more information, feel free to contact us at Shaw Remodeling.